I love my to-do list. I keep it in my planner and write down everything that comes to mind. I have huge goals and focus on breaking them down into manageable bites every month. But last month? I was totally unproductive. After reading David Allen’s Getting Things Done, I realized why my productivity came to a screeching halt. My to-do list wasn’t working for me. 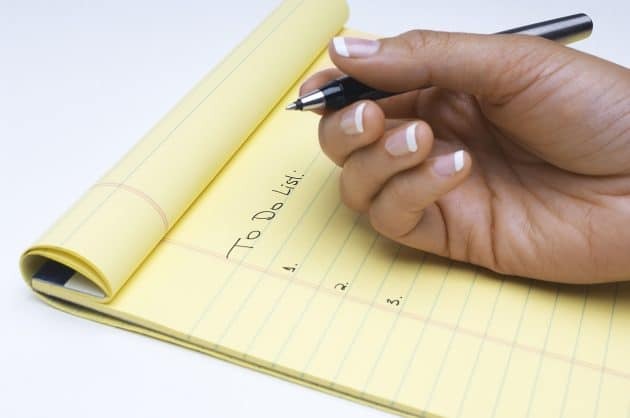 Apparently, there’s more to making a to-do list than just writing down everything you could possibly want to accomplish! Right now, get a copy of The Ultimate Productivity Bundle to get all the help you need with creating (and managing) your to-do list. I’ve always struggled with getting sidetracked, especially at home, but since breaking down my to-do list based on the following steps, I’m able to stay focused and get tasks done faster. When you’re first creating your to-do list, make a point to list everything. It may seem overwhelming and pointless at first, but I promise that this step will help you focus and get your bearings. Even if you think of something that you know you won’t work on for weeks or even months, like planning next year’s family vacation, get it out of your head. Also, don’t forget to list “unimportant tasks” or things that will only take a few minutes. 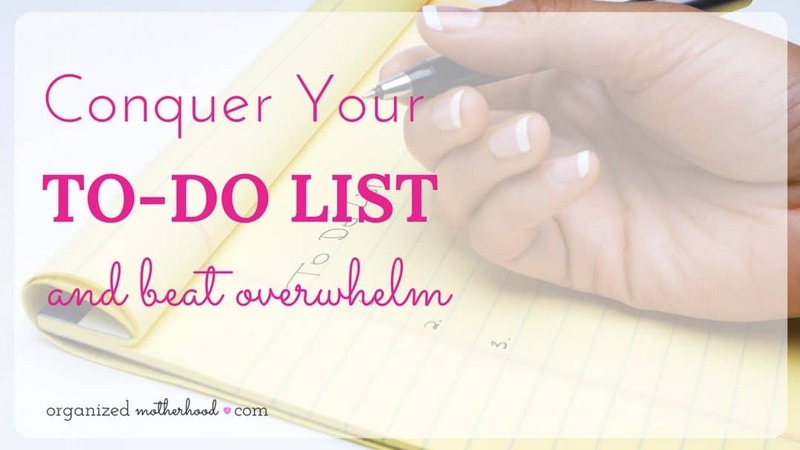 As you’re writing your list, don’t worry about prioritizing the tasks or organizing them. I’m always tempted to list phone calls in one area, housekeeping items in another, etc. But while that’s a great way to feel organized, it can stifle your creativity. You’ll spend too much time trying to remember all the phone calls that you need to make and forget about some of the other tasks. Take time to write down each item as you think about it. We’ll prioritize later! Once you write things down, give yourself permission to stop worrying about it. 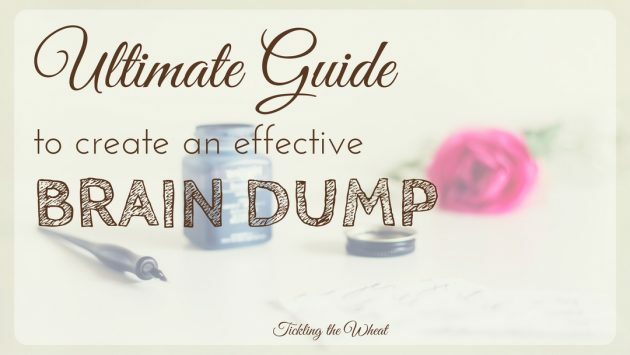 One of the beauties of creating a task list or a brain dump is that everything is out of your head. It’s written down and you’ll no longer need to “remind yourself to remember” it. You’ll also be able to see big picture issues. If you wrote down “leave early for work in case it snows,” you’ll be able to plan ahead after watching the weather. Now that you got everything out of your head, it’s time to start organizing your list. Some of the items on your list may require no action at all. For example, if you wrote down “leave early in case it snows” but it’s June, you can save that fear for another day! If an item can be moved to a different time, save it (we’ll get to that in the next step). Otherwise, if there’s nothing that you need to do (like worrying about whether it’s going to rain during your son’s baseball game tomorrow), cross the worry/task off your list. If you’re struggling to prioritize and know exactly what belongs on your list, I loved the way that Make Over Your Mornings teaches you exactly how to find your most important tasks and eliminate anything that’s not a priority. For every item that’s still on your list, you’ll want to assign a time to work on it. Some of the items on your list may be projects that require more than one step, like planning a vacation for next summer. Write each step on the list, like book a hotel, call about discounted resort tickets, get airfare, buy swimsuits, etc. Then put those steps in order and assign deadlines to complete each task. As you’re assigning deadlines, be conscious of your time. Most people assume that they’ll have more time in the future, but most likely you’ll be just as busy tomorrow as you were today. Also, things usually take more time than we think. For example, if you’re calling about buying discounted Disney tickets, that phone call might only take two minutes, but if you get placed on hold or need to make several calls, it will take longer. 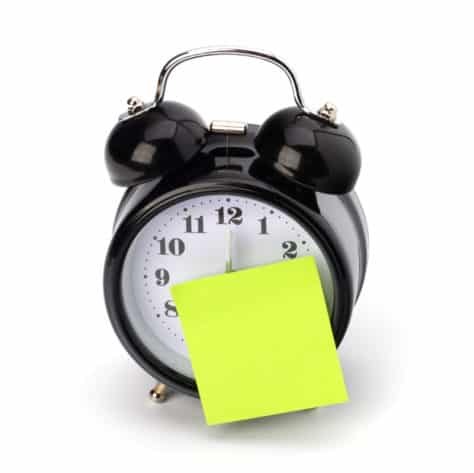 As you’re scheduling your tasks, try to allow for extra time. I’ve found that scheduling items in reverse order is helpful, especially when you’re trying to break down large goals or long-term projects. For example, if you want to paint a nursery in your house, your deadline would be a month or two before the baby’s born. You would need to schedule time before that to gather paint swatches, buy the paint, and choose any coordinating accessories for the baby’s room. By thinking about the end result and working backward, you won’t miss any steps. Some items on your list, like replacing your furnace when it breaks in a few years, don’t need to be done right now. Create a separate list (I love David Allen’s idea to call it a “Someday/Maybe List”) for things that don’t need to be done in the near future. As you review this list, you may realize that some of these tasks don’t need to be done at all. Note: I created a someday/maybe section on my planner. This is where I jot down notes for things that I’d like to get done “someday/maybe.” I also use this section to occasionally move tasks off my “someday/maybe” list and do them today. Next, create a list of things that need to be done this year. If you have a specific date in mind, like planting flowers in May, jot the deadline next to the item. If not, just leave the item on your “this year” list. Are there any upcoming events, like a birthday, holiday, or other tasks that need to be completed this month? Include them on a separate list for the current month. This is also a great time to look at your “this year” list and further breakdown tasks. For example, if you planned on planting flowers on May 1, you’ll need to buy the flowers or bulbs at the end of April. From your “this month” list, create a list of tasks that need to be done this week. Also, include any set appointments or scheduled events that happen on a weekly basis, like your child’s baseball practice. Use your “this week” list to create a list of items that you want to complete today (or the next day, if you create your list before bed). Your today list should be a list of your most important tasks to get done, and it’ll help you stay focused throughout the day. Once you have your to-do list broken down into annual, monthly, weekly, and daily tasks, you’ll want to break your daily tasks down even more. Each day, find your top three tasks to focus on. I normally do this before bed each night so that I can look at my planner first thing in the morning and already have a plan set in stone. When I was working, I would spend the last few minutes before I left work creating a plan for the next day. When I arrived in the morning, I could quickly get to work and start focusing on my most important tasks. As the day wore on and I started to run out of energy, I would work on less demanding tasks. Make sure to focus on three small items every day. At the top of my daily planner, I write down my top three items to work on that day. Even if I get nothing else done, at least I know I accomplished my most important tasks. 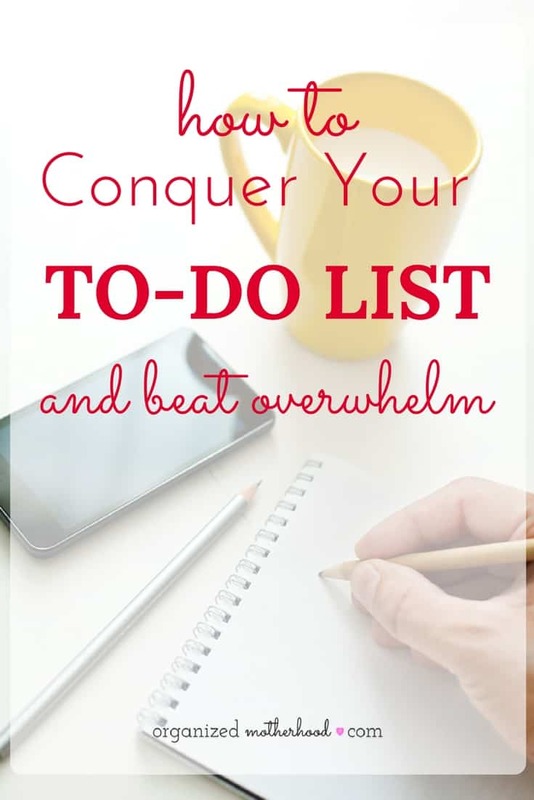 By getting everything out of your brain and then categorizing your list, you’ll have a much more manageable to-do list. You’ll have a plan for your tasks and you can stop worrying that you’re forgetting something. Even if you get sidetracked, you still have something concrete (or at least in writing in your planner) to keep you on task.